Bermuda Regiment soldiers are to be sworn in as Special Constables in a bid to boost the defence force’s ability to help out the Police Service. 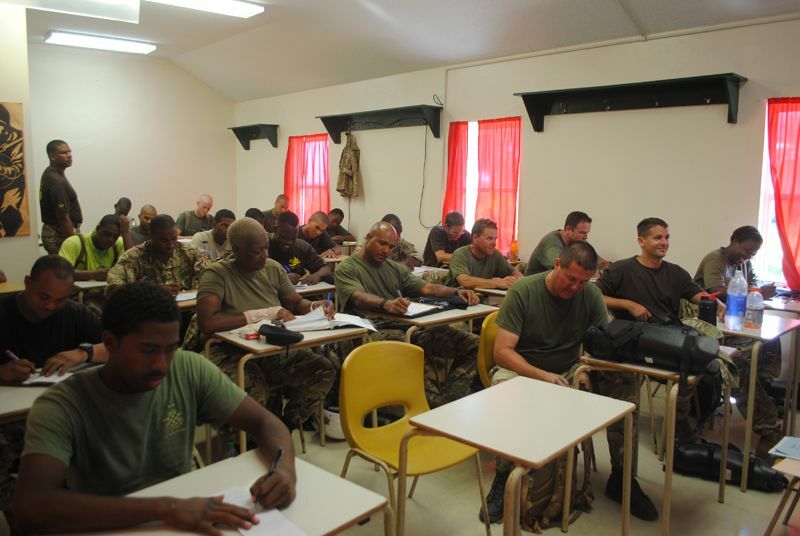 A group of around 30 soldiers, drawn from public order specialists the Operational Support Unit [OSU], Boat Troop and the Regimental Police, have started training under police instructors to earn a warrant card and status – when required – similar to the existing Reserve Police. Soldiers last weekend started the first phase of training – learning police crowd control and public order tactics as well as classroom-based lessons on the law. Boat Troop Corporal Tyler Smith said: “We’ve been learning police tactics and powers of arrest so we can have the same powers when we work with the police out on the water. OSU Private Donald Smith added: “It’s been very enjoyable but exhausting – we’ve done a lot of training in the law, rights of arrest and things like that. 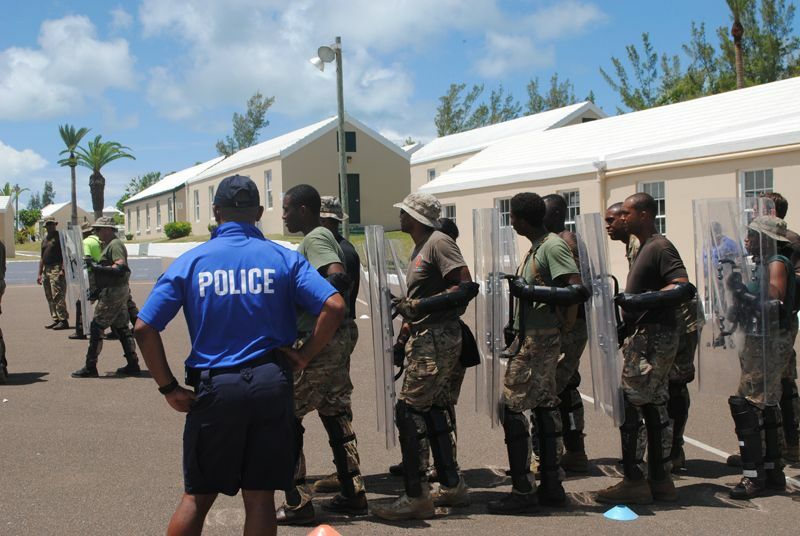 Soldiers spent three days either in classrooms studying for exams or outside, practicing police-style shield drills for crowd control under police instructors Sergeant Michael Thomas and PC Brian MacNab. Regiment Commanding Officer Lieutenant Colonel Michael Foster-Brown added: “We already work closely with the police, but this is a milestone in the relationship between us. Police Commissioner Michael DeSilva said soldiers will only be authorized to use their police powers when they are directly engaged in a supporting role to police patrols. And he said the extra strength – particularly in the Regiment’s Boat Troop – would be vital for major events like the 2017 America’s Cup. Mr DeSilva added: “It will increase the Regiment’s ability to help out if we get to the point where the police are absolutely stretched. Rob Peter to pay Paul. No it’s not. This will give them already in the Bermuda Regiment the authority to arrest etc. as do the Police have. You know Onion Juice, this is the first time I agree with you. I was going to say same when I read the first sentence of this posting. There is hope for you after all. Preparing for an event are we? De writing is on de wall. Exactly, last month army helicopter flying around, landing at Warwick Camp,during Gonzolo the British Navy battle ship just happened to be in the area to “help out”. Now extra police enforcement. Do something for the people to get on their feet and you wont need to bring in the troops. A dumb move if you ask me. Have they been properly vetted to carry out any police type work? The regiment isn’t all that it’s simply a political football. I’ve heard for some years that the regiment were to take over duties at governors house. I heard the governor doesn’t want regiment to guard him. So if they aren’t good enough to guard the governor then one must wonder how they good enough to discharge any duties at all as police officers? Agreed, especially looking at a few of those selected to take this ‘Special Constable’ course. Thankfully they are required to be under police supervision in order for their powers to be in effect. There are some good soldiers up there, unfortunately it looks like a lot of them have been looked over for this course. That’s just protocol. Trust me I know. I understand why they the Government is doing this but I am not sure I like the idea of soldiers of the army becoming police. Merging police functions with the army will define Bermuda as not just operating as a police enforcement state but a state that depends on the military enforcement. Its one thing to be under the control of the police its entirely another thing to be under the control of the military. If you are protesting in the street and you get out of hand and your assaulting the military guy its difference than your boy in the police who you probably know from school. Having the power of arrest for the soldiers of an army is not the same as the police. They loyalty is different. Will these soldiers have a different kind of uniforms so we Bermudians can tell the difference when some one gives us orders to move on. Will it now be a soldier in the military stopping us and denying our constitutional rights to go about Bermuda as we see fit without hindrance from authority unless we are breaking the law. I do not want to see a police state or a military state enforcing the directions of the civil service. When the Bermuda Regiment Military army is necessary to keep law and order we are not longer a democracy of citizens who comply with laws that were passed by a government of our elected representatives. Where are the people who have a vested interest in freedom speaking against this development. One thing I can say about some Bermudians. A lot of Bermudains are not thankful and proud of what your Bermuda Regiment does for you. Stop being small mined and think of all the good stuff they have done for your community. The first phase to a paid full-time Regiment….